Perfect tool for when you need a lightweight easy to use rafter square; use for marking and cutting of rafters, stairs or any basic angle; all gradations are molded-in so they will not wear off during repeated use; durable, lightweight, ergocast material; molded-in conversion tables; easy-to-read gradations marked with precise cutting angles base enables easy marking and cutting. Used for marking angles, for cutting rafters and for scribing lines. Also can be used as a protractor and saw guide. Easy to read measurement scales and durable engineering. Permanent deep markings. High visibility orange color. Use for quick and accurate measuring of rafter and angle layout. Includes: instruction booklet. Features a solid aluminum cast body with exclusive CNC machined edges, permanent molded gradations, and a low-glare, protective coat finish; thick edge is useful as a saw guide; continuous scribing notches ideal for ripping at 3-1/2" and 5-1/2". Can also be used as a ruler or can be used to measure angles. The diagonal edge has markings for laying out rafters, roof trim, and stair angles. Solid heavy duty aluminum extruded square will not bend, break, rust or corrode, stamped conversion tables and thick edge makes for a safer saw guide. Functions as a framing square, try square, miter square, protractor, saw guide, stair gauge and out-of-square corner angle finder. It's constructed of lightweight high-impact structural composite. This tool can be used with siding and other delicate materials, since it won't mar softer finishes and larger body covers more material, centerline for determining center of round stock, and a beveled edge for ease of reading. Includes: 60-page Swanson Blue Book and layout bar with hardware. Functions as a torpedo level and angle finder. It has many of the same features as the one and only Speed Square, but is constructed of lightweight high-impact composite. Center line guide for locating center of round stock, bulit in block level that is easy to read from all angles, and a beveled edge for ease of reading. Five tools in one: a tri-square, a miter square, a protractor, a line scriber, and a saw guide. The Speed Square is constructed of durable heavy-gauge aluminum alloy. Includes markings for Swanson's One-Number Method of rafter layout, and is packaged with the Swanson Blue Book of Rafter Length and Roof Construction. Matte finish to prevent glare. Functions as a saw guide, for special angle measurements and cuts, or as a protractor. Aluminum construction for durability. Includes: detailed instruction book. Durable, light weight "Structo-Cast" high-impact molded frame with permanent molded graduations for quick and easy measurements, thick edge is useful as a saw guide, built-in scribe notches. Fluorescent orange color is easy-to see. Five tools in one: a tri-square, a miter square, a protractor, a line scriber, and a saw guide. The Speed Square is constructed of durable heavy-gauge aluminum alloy. Includes markings for Swanson's One-Number Method of rafter layout, and is packaged with the Swanson Blue Book of Rafter Length and Roof Construction. Matte finish to prevent glare. Used for marking angles for cutting rafters and for scribing lines and als; durable rust-proof ABS plastic; permanent deep markings; can be used as a protractor, saw guide and tri and mitre square; high visibility orange color. Functions as a 0 degree to 90 degree protractor scale as well a saw guide. Durable aluminum construction with black body with yellow graduations provides maximum readability in all light conditions. Used for marking angles, for cutting rafters and for scribing lines. Also can be used as a protractor and saw guide. Easy to read measurement scales and durable engineering. Solid aluminum body for assured durability and precision CNC machined edges for guaranteed accuracy; "EZRead" laser etched graduations and numbers are highly visible; thick edge is useful as a saw guide; continuous scribing notches - ideal for ripping at 3-1/2" and 5-1/2"; low-glare, protective anodized finish. 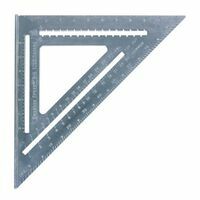 Used for marking angles for cutting rafters and for scribing lines and als; durable rust-proof aluminum body; permanent deep markings and can be used as a protractor, saw guide and tri and mitre square. Swanson Imperial Speed Square, Series: Big 12, 12 in, Aluminum, Matte, For Deck Framing and Stairway Layout Solid aluminum extruded square will not bend or break and has graduated notches for pulling layout lines, stamped conversion tables. Mark or cut boards up to 12" wide. Thicker frame design ensures safe use as a saw guide. Includes: instruction manual with complete rafter tables. Features a solid aluminum body with CNC machined edges for greater accuracy and durability, permanent graduations and numbers; thick edge is useful as a saw guide. Scribe notches starting at 1-3/4" transfer outside increments from pivot point. Low-glare, protective powder coated finish. Functions as as a saw guide, bevel or protractor and is made of heavy duty aluminum for durability. Comes with an adjustable arm and features Common, Jack and Hip, and Valley scales for various applications. Black body with yellow graduations provides maximum readability in all light conditions. Functions as a framing square, try square, miter square, protractor, saw guide, stair gauge and out-of-square corner angle finder. It's constructed of heavy-gauge aluminum alloy and includes the Layout Bar for use in determining out-of-square corners. Black graduations for easier reading; matte finish to prevent glare. Includes: Swanson Blue Book of Rafter Length and Roof Construction, and layout bar and hardware. Used for marking angles, for cutting rafters and for scribing lines. Also can be used as a protractor and saw guide. Easy to read measurement scales and durable engineering. Solid aluminum body for assured durability and precision CNC machined edges for guaranteed accuracy; "EZRead" laser etched graduations and numbers are highly visible; thick edge is useful as a saw guide; continuous scribing notches - ideal for ripping at 3-1/2" and 5-1/2"; low glare, protective anodized finish; 1/8" scale reads from 1-1/2" to 8-1/4". "Auto-Lock" blade assembly.